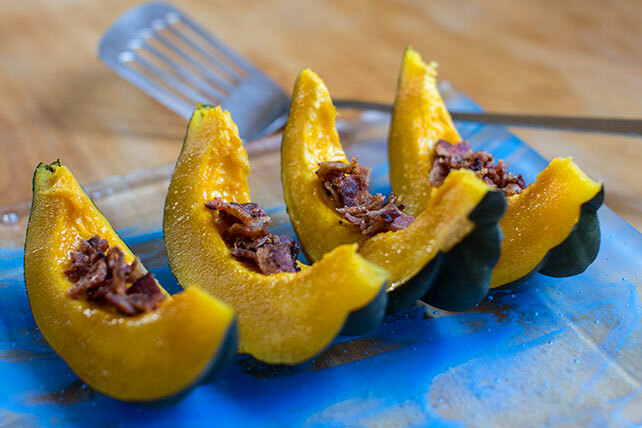 Make a tasty seasonal dish with our Simple Acorn Squash recipe! With just 4 ingredients, this acorn squash recipe is ready to eat in less than 20 minutes. Place squash, cut-sides up, in microwaveable dish; cover with waxed paper. Microwave on HIGH 12 to 14 min. or until squash is tender. Meanwhile, cook bacon 8 to 10 min. or until crisp, turning occasionally; drain. Cut squash into wedges; brush with combined syrup and dressing. Crumble bacon; sprinkle over squash. Whole uncut winter squash varieties, such as acorn, spaghetti and butternut, do not require refrigeration. Store in a cool dark place for up to 1 month before using as desired.